In Saigon the entire week between Christmas and New Year’s Day on the western calendar was celebrated with a combination of elements from both Tet (the Vietnamese lunar New Year) and the west. The yellow flowers on this window are the traditional Vietnamese New Year’s flower. Our waitress didn’t know the name of them in English but in Vietnamese it translates to ‘golden’ and gold is good. They also bloom prolifically this time of year adding another reason for their popularity. We were staying in a warren in Saigon’s District One and across from that was a large public park all lit up for the week and filled with performances in the evenings. Once we made it across the terrifying traffic we came upon a sort-of peaceful pond with boaters. There were traffic jams in the pond too! 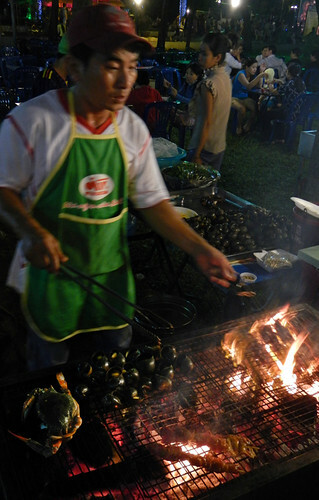 Huge arrays of street food were available and it all looked amazing. 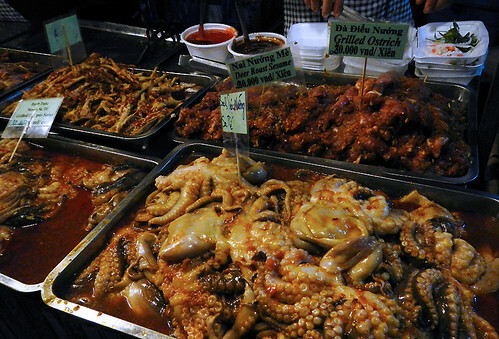 ‘Grilled ostrich’, chicken’s feet, spicy-looking squid and ‘deer roast sesame’ were on offer. 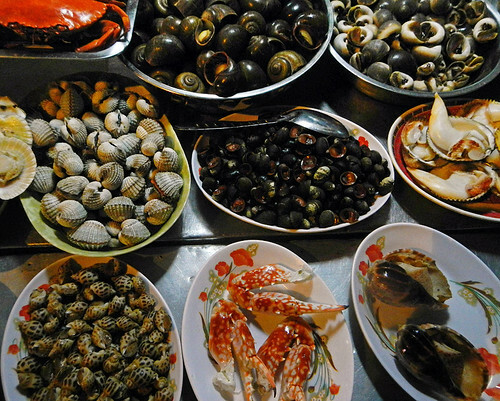 More seafood selection. 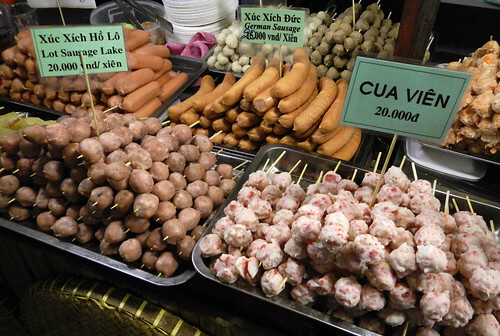 ‘Lot Sausage Lake’, ‘Cua Vien’ and ‘German Sausage’. 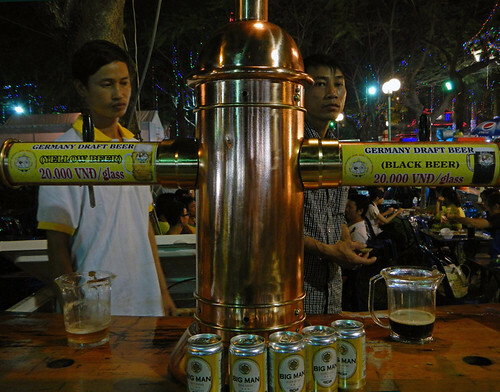 Like one of the sausages above, the draft beer is German and comes in two flavours: yellow and black. 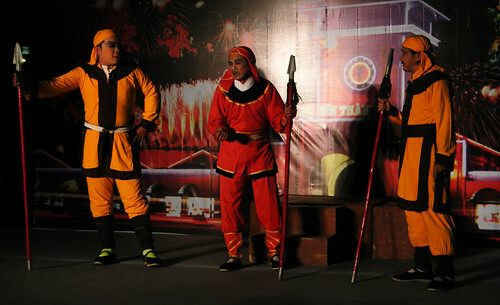 The performances went on all week and ranged from ‘bing bong’ music, to screechy singers, to rock and roll, to comic opera… to ‘pop’ Vietnamese style…. And then who could forget the song, ‘It was an its, bits, teeny-weeny yellow polka dot bikini’ as sung by Alvin and the Chipmunks. After our trip to the Mekong I put together this special New Year’s message out of fruit. The Vietnamese also put out ‘flower’ messages – from Baohouse.net comes this interesting post on the significance of the flowers chosen to celebrate Tet: Vietnamese New Year Flowers. This Happy New Year banner has the traditional yellow flower of a small tree which I now know is called the ‘Vietnamese Mickey Mouse Plant’ (thanks to Chris Galvin, herself a writer that could tempt anyone go to Vietnam) along with pink peach blossoms. 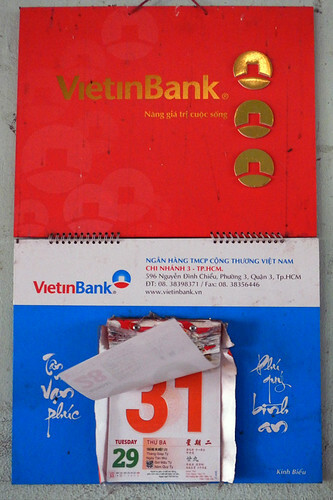 Lovely post…I wish I were in Saigon for NY this year! Of course I had to look up Mickey Mouse plant and when I saw the shape of the fruit I totally got where the name came from! I also found a fascinating post on New Year’s flowers in Vietnam and the stories behind them: http://baohouse.net/post/16627326040/vietnamese-new-year-flowers . Yes, Saigon is a bundle of energy and the performances had so much variety and were so much fun to watch. Happy New Year back at you!